Stamford's Gareth Jelleyman (left) was stretchered off in the match against Nantwich. Stamford kicked off a new era with a 2-2 home draw with Nantwich in the Northern Premier Division yesterday (December 13). The Daniels were hosting the first competitive fixture at their new Zeeco Stadium, but required a superb diving header from Jordan Smith 10 minutes from time to rescue a point. Nantwich claimed the first goal at the Borderville complex in front of an excellent crowd of 819 in the third minute before Smith set up Jorrin John for an equaliser 10 minutes later. Stamford, who are 16th in the table, suffered two serious injury blows as former Posh full-back Gareth Jelleyman left the field on a stretcher and skipper Richard Jones was taken off with a head injury. Spalding were denied the opportunity to continue their brilliant Division One South form as their scheduled fixture at struggling Market Drayton was a victom of bad weather. In the United Counties Premier Division it was a great day for leaders Rushden & Diamonds who are now 10 points clear at the top following a 5-0 win over Harrowby. Second-placed Yaxley lost ground as they were beaten 2-0 at Kempston. 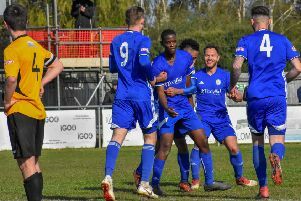 Cuckoos boss Brett Whaley said before the game that his team have a poor record at Kempston and the home side proved his point with two first-half goals. Yaxley have a game in hand on Rushden, but Holbeach remain better placed to challenge the leaders. Their game at home to Oadby was postponed because of a waterlogged pitch to leave them 11 points off top spot with three games in hand. Huntingdon also lost ground after conceding a last-minute goal in a 3-3 draw at Thurnby Nirvana, the FA Vase opponents in the last 32 for Holbeach. Goals from Chris Jones, Declan Rogers and Ben Cullen had edged Huntingdon 3-2 in front before Thurnby’s late strike. Peterborough Northern Star are down to seventh after their game at Sileby was postponed, while Deeping Rangers suffered a first defeat in seven Premier Division matches. Spencer Tinkler’s penalty in added time gave Deeping a 1-0 lead at half-time against Newport Pagnell, but the visitors struck twice in the second-half to claim victory. Peterborough Sports were top of Division One last month, but they are now down to fifth after suffering a second successive 1-0 defeat at the hands of Northampton-based opposition. In-form ON Chenecks won the game with a goal 20 minutes from time to stretch their own unbeaten run to 13 matches. Blackstones suffered at the hands of Division One’s leading scorers as they were crushed 6-1 at home by Wellingborough Whitworths. Addie Steffiari scored a consolation goal in his first appearance of the season for Stones. Wisbech beat lower division Bugbrooke St Michael 1-0 in the United Counties League Cup thanks to a second goal in two games from youngster Jacob Smith. March Town are up to third after an excellent 4-0 win at Stowmarket in the first division of the Thurlow Nunn Eastern Counties League. Stamford 2 (John, Smith), Nantwich 2. Wisbech 1 (J. Smith), Bugbrooke St Michael 0. Thurnby Nirvana 3, Huntingdon 3 (Jones, Rogers, Cullen). Postponed: Sileby v Peterborough Northern Star, Holbeach v Oadby. Blackstones 1 (Staffieri), Wellingborough 6. Northampton ON Chenecks 1, Peterborough Sports 0.